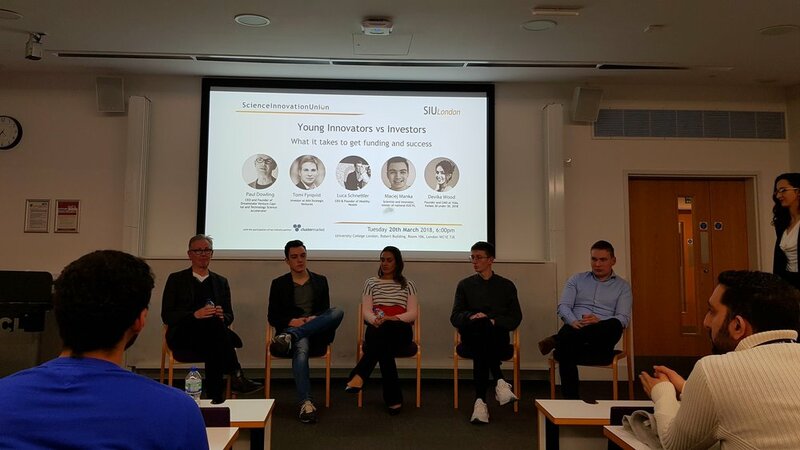 On 20th March 2018, SIULondon hosted a very successful entrepreneurial event in UCL. The event featured a panel consisting of three young innovators and two investors: (i) Maciej Mańka, an innovative student at UCL and 1st Prize winner of the national finals for European Union Contest for Young Scientists; (ii) Luca Schnettler, CEO and Founder of HealthyHealth; (iii) Devika Wood, Founder and CEO of Vida; (iv) Paul Dowling, CEO and Founder of Dreamstake Ventures; and (v) Tomi Fyrqvist, associate at AXA Strategic Ventures. The event started with a short presentation by our industry partner, Clustermarket. The co-founder Tobias Wingbermuehle briefly introduced the company, and shared his startup experience with the other co-founders after they had completed their masters in the UK few years ago. Clustermarket brings disruptive models similar to AirBnB into the scientific industry, by providing an online platform to allow researchers to easily book lab equipment and services from nearby institutions. The event proceeded with each panel speaker presenting for about 15 minutes. The first presenter was Maciej Mańka, who is an innovator with a high determination to realise his ideas. He shared his journey into the world of innovations at age 16, when his first project on investigating the impact of the environment on the shape of ant moulds got listed among the top 28 projects for polish EUCYS. His next project was a lung-on-a-chip device, and the idea came from something as simple as reading a scientific paper from Harvard. He said he had the inner drive to do everything he could to reproduce the device, because no one had thought of producing such a device in Poland before him. For this technology he needed to fabricate a porous membrane by 3D printing, and not even this was available at Krakow at that time, so he devised alternative methods by using porogens to produce the membrane. The project won him the 1st prize in the Polish EUCYS. For his latest project, he is at UCL Ear institute, where he is trying to translate a test battery to the World Hearing Centre at Warsaw. The device is capable of diagnosing how the brain localises sound for patients within 10 minutes. He summed up that his achievement is attributed to reading about science, actively talking to experts and to determination. The next speaker was Luca, who is originally from Frankfurt. After spending a few years in Bristol and London, he went on to study business management. However, he found it was not a good fit and wanted to do something more entrepreneurial. So he quit university and started HealthyHealth, with the aim to move the healthcare system from reactive to preventative. HealthyHealth collects digital data from users to calculate individual risk profiles, and then uses this to provide individualised prevention plans to reduce the customer’s detected risk. Presently, they are active in the UK, France and the Middle East, and his big wish is to expand it to Germany, Latin America and the US. Luca’s key advice was that an entrepreneur has to really enjoy what he does, as the process is incredibly challenging: For instance, he is responsible for his own earnings, for paying his employees and, also, his business partners. ‘It is important to mingle as much as possible and to believe that what you are doing is worthwhile. And don’t give up. Take up opportunities whenever possible,’ he said. Devika Wood shared her personal story of starting up Vida. When she was 10, she lived and cared for her grandmother, who suffered from dementia and epilepsy. They had really bad experiences with carers they hired, with issues ranging from carer quality to communication. After university, she attempted to pursue a PhD in cancer biology but quit within the first year, as she didn’t feel it was right for her. She then went on working with startups including Babylon Health, hoping to gain enough skills to start her own business. Reflecting back, she emphasised that she should have had the confidence to just do it, as we will never learn enough skills to start a business. Even now in Vida, everyday is filled with new challenges and she is still constantly learning. Devika does not have tech knowledge, and she thinks that the hiring process is the key factor in building a company. She presented some of Vida’s technology platforms, including algorithms, AI, a client app, as well as a next-of-kin app. After the innovators’ presentations, the first investor to speak was Paul. He shared his personal venture from dropping off from school to becoming a salesman. Paul had his first big breakthrough in 1984, when he sold the world’s largest LCD screen at that time. He then moved on to management consulting, which was when he did an MBA and got the ‘startup bug’. 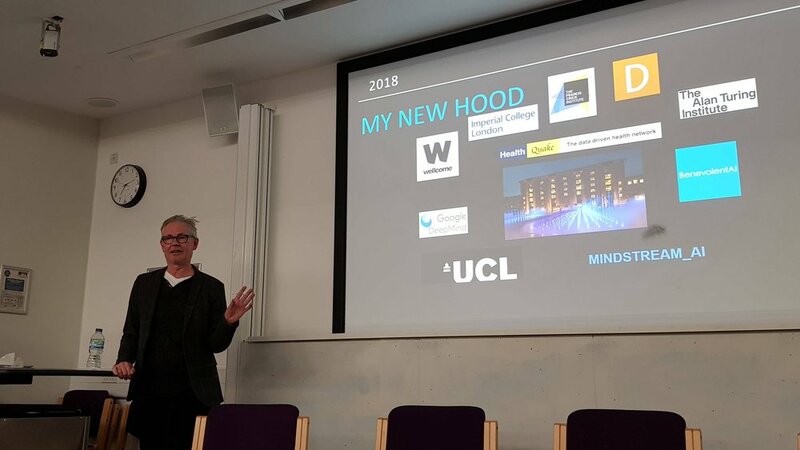 In the last 20 years he spent much time in Shoreditch and on Google Campus, but more recently his ‘new hood’ is situated at Kings Cross area, where the deep tech sector is booming. He described his job like ‘ being Robin Hood’, because he had to convince partners like the Wellcome Trust to invest money through him on startups. He thinks the definition of an entrepreneurship is not about having an idea, but about solving a real problem. One has also to be passionate and prepared to take risks. His final advice for aspiring entrepreneurs was to focus on integrity, tenacity and being able to sell. Tomi introduced his company and the venture capital perspective in providing funding. He emphasised that the technological landscape has been shifting since 2000, with 2010 being the first year of evidence in terms of global leadership. ‘We are at the point where software is eating the world,’ he said. More regulations will be foreseeable, and the incumbents in the industry will have to figure this out. He also introduced several key forces that are moving the landscape on the consumer and business-to-business sides, including new customer needs, new data, emerging business models and disruptive technologies. Furthermore, cloud migration seems to be one of the key catalysts to drive process such as business process management (BPM) and robotic process automation (RPA), which will ultimately pave the way to AI in enterprises in the next wave. Some key emerging leaders in this field could be UiPath and Celonis. Finally, Tomi described the key characteristics of a valuable startup: (i) team; (ii) addressable market and (iii) unit economics. Finally, a 30-minute panel discussion took place, and many interesting topics were discussed. The panel showed tremendous enthusiasm in the discussion and in addressing questions from the attendees. Asked what kind of tech are on the rise, the investors think that AI and machine learning will penetrate every market, and that health technology companies (such as Vida) are definitely useful due to the aging population and a need for better care. Paul emphasised that the most important thing is timing. The investors were also sceptical of blockchain technology, as it appears to show more issues in the future. Luca added that it is important to think ahead where one’s product would be in 5 years, and suggested to plan ahead when and how to diversify the products. The panel also discussed about challenges. One big challenge to entrepreneurs when starting a business is to bring the team together, as at that stage most people tend to have other work commitments to earn their living. One advice was to transfer new ideas into a pitch deck consisting of 10 slides that can be presented to angel investors easily; these slides would include market opportunity, the problem and what the company is going to do. It is also essential to go to networking events. Such events can be useful to create relationships with investors, and also to find new additions to the company – that was how Devika found her CTO to develop the technology platforms for Vida. Moreover, it is important to maintain a good relationship with all potential investors at every stage of the company. Running a startup is a continuously challenging process. Devika said she is planning to apply for the ‘Series A’ funding end of this year, and she is still continuously testing her business model and second-guessing herself all the time. However, it is the passion and determination that is important to make her stick to it. Another useful piece of advice to aspiring entrepreneurs is to consider starting up with accelerators and incubators, as they provide a nesting period for a company to begin growing. However, it is important to be careful with equity, as this can be a double-edged sword. Some investors may take advantage and give a poor offer, but some can be important because of providing capital vital for the development of the idea. A very interesting discussion on more regulated sectors also developed, with an example about bringing in new diagnostic medical devices into the NHS. Paul claimed that having NHS as the sole customer would likely put investors off. He suggested that there are ways to get around the regulations, for instance, by working with private sector to test the model. Devika added that her company serves the NHS too, but said it can be complicated due to the complex administration processes and a lag time has to be expected. As a potential solution, one could serve the private market alongside the NHS. Luca thought that setting a big goal without a strategy is usually not so useful. Instead, it is important to first think how to generate revenue, as it will bring more investments in to achieve the long-term goals. The event ended with an interactive 1-hour networking session over wine and snacks at the foyer of Roberts Building, UCL. Newer PostHow are tech giants innovating in the healthcare space?